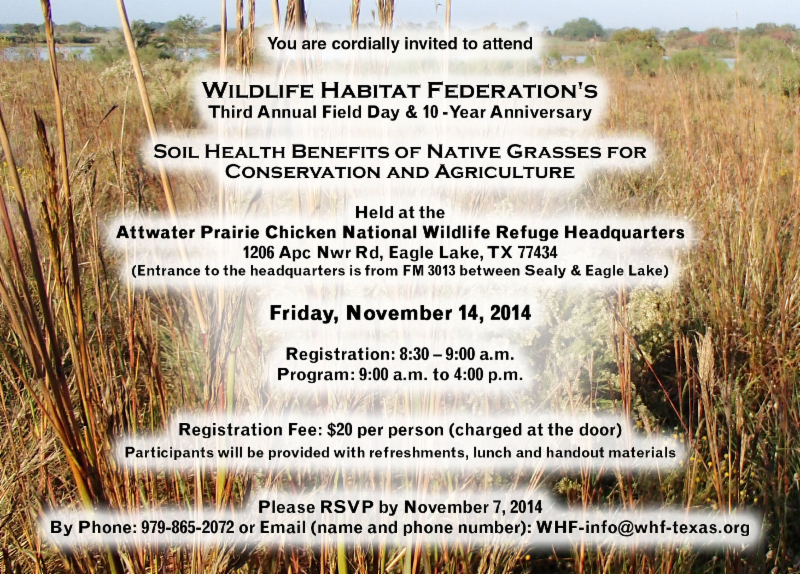 The Wildlife Habitat Federation’s (“WHF”) Third Annual Field Day will be held on Friday, November 14, 2014, at the Atwater Prairie Chicken Wildlife Reserve near Eagle Lake. Registration is slated for 8:30 – 9:00 a.m. with the program beginning at 9:00 a.m. and lasting until 4:00 p.m. A registration fee of $20.00 per person will be charged at the door. With the registration fee, participants will be provided with refreshments, lunch and handout materials. 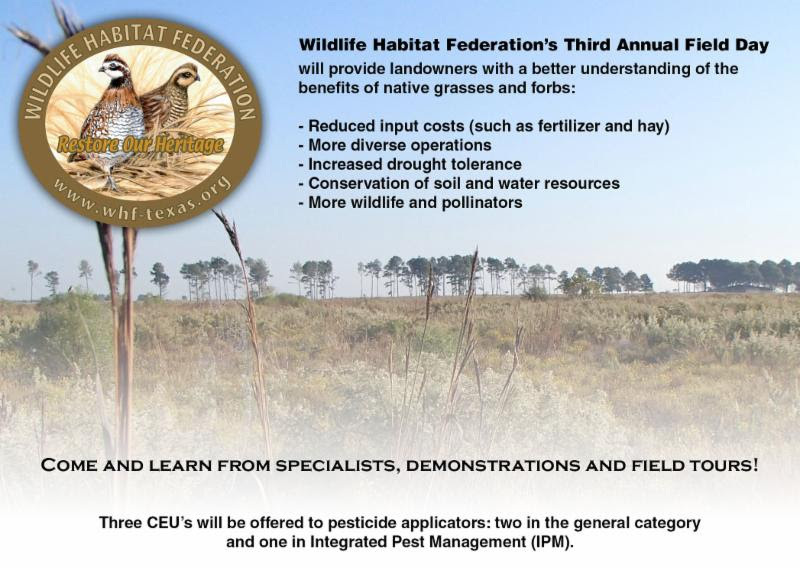 The purpose of the field day is to provide landowners with a better understanding of why restoring native grasses and forbs can benefit both the livestock producer and conservationists. Following the success of its first 7-mile native habitat corridor, WHF is now helping landowners restore thousands of acres to native prairie grasses and wildflowers. This interest has largely been due to a desire of landowners to reduce long-term input costs, like fertilizer and hay; to have more drought-tolerant plant species that attract wildlife and to better protect our natural resources, including soil, water, air and wildlife. 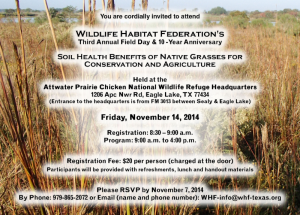 This meeting will be held at the Atwater Prairie Chicken National Wildlife Reserve, which has become the epicenter for WHF’s rapidly expanding program. Come and learn from specialists, demonstrations and field tours how and why WHF is working with partners on sites in 12 surrounding counties to provide landowners with technical and financial assistance based on the belief that we can progress and still protect our prairies (which includes, but not limited to, wildflowers, bobwhite quail and scores of other birds, butterflies, bees, box turtles, little bluestem and other native grasses). 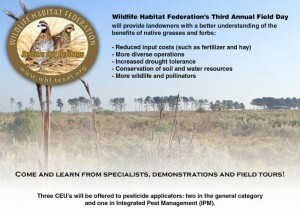 For more information about the field day, contact the Wildlife Habitat Federation. To register for the event, contact Jim Willis at (713) 201-3559, or visit the website http://www.whf-texas.org. 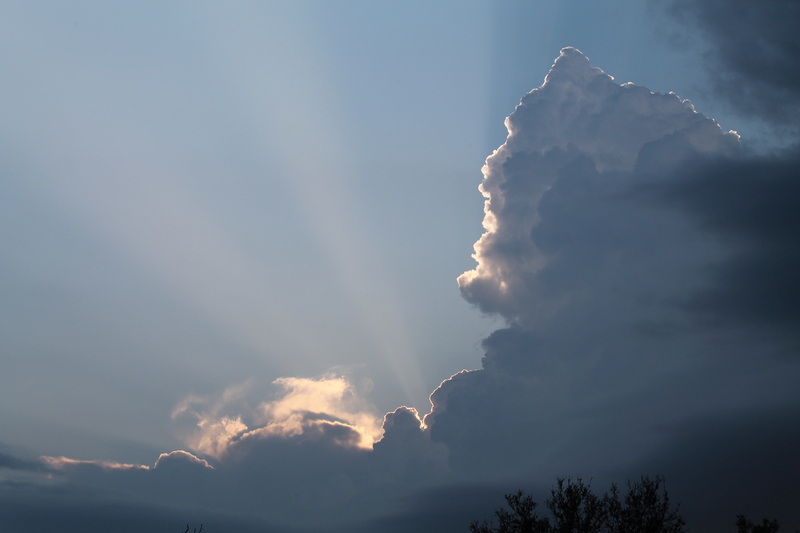 Three CEU’s will be offered to pesticide applicators. Two in the general category and one in Integrated Pest Management (IPM). Your 2015 ORWMA committee has been selected. Here are the results: Event Chairperson-Jean Herring, co-chair-Peggy Wilcox; Habitat Chairperson-RC Lumpkin, co-chair Glenda Lambert; Birding Chairperson-Brenda Lavergne, co-chairs Marilyn Rutledge & Glenda Lambert; Predator Control Chairperson-Douglas Mason, co-chairs Jerry Rogers & Vernon Wallace; Whitetail Deer Chairperson-David Mitchem, co-chair Jack Jetton; Secretary Treasurer-Barbara Mitchem, Vice President-Vernon Wallace; President-Larry Petter. This is the first year ORWMA has added co-chairs to the Executive Committee. We look forward to building our teams. If you have a special interest in any of the committees please contact any chairperson so that you are included in their correspondence. Plans are underway for the 2014 Wounded Warrior Hunt. We are expecting 15-20 participants and great hunting weather! We will be searching for hunting stands and lodging for our guests. David or Vernon may be calling you soon! Items for gift bags are needed; let Barbara know if you can help. If your company or employer would like to sponsor or make a donation, contact Barbara. We would like to send our Wounded Warrior Guests home with some venison this year. In previous years, some of our guest returned home with empty ice chests. Thanks to an ORWMA member, Jason Frick, he suggested we harvest some does in advance. I have decided to implement this idea and ask any avid Oakridge hunter to take an additional doe for this purpose. I will provide the processing and freezing for the wounded warrior event. Check in the doe and you will be issued a replacement permit. Give me a call for additional details, 713-825-7332. UPCOMING EVENTS – Wounded Warrior Hunt December 6 & 7. Mark your calendar. A weekend agenda will be sent to you soon. Chili Cookout December 5, 2014. Each year we cook chili for the Saturday night supper for the wounded warrior hunt. We start Friday at 8:00 AM. Breakfast will be provided, fellowship will be enjoyed, and stories will be told. Join me at the Petter corral, 1220 Miller Creek Loop. Visit our website: www.orwma.org Read our articles about habitat and birding. Don’t be left out! clear grass away from around the pile 10-15ft. Safety for each property owner, resident, the ranch property and all of our neighbors is critical so please proceed with care and caution.